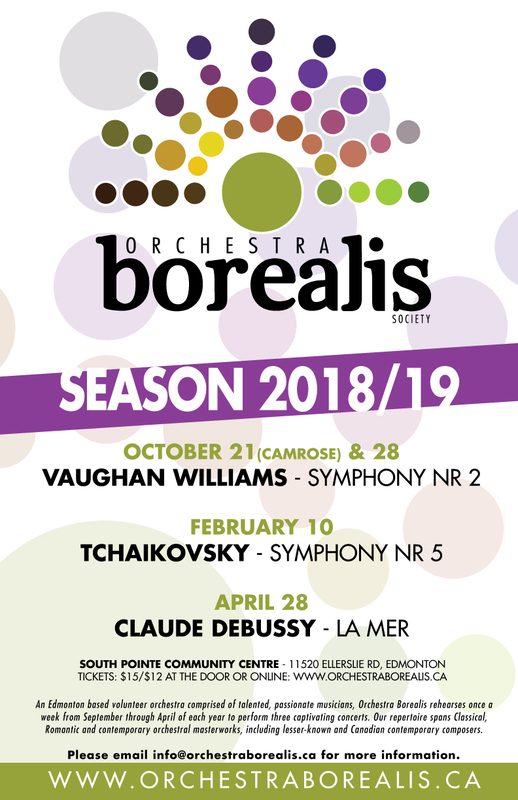 Orchestra Borealis is excited to begin its ambitious third season with the music of Telemann, Vaughan Williams and Ponchielli. 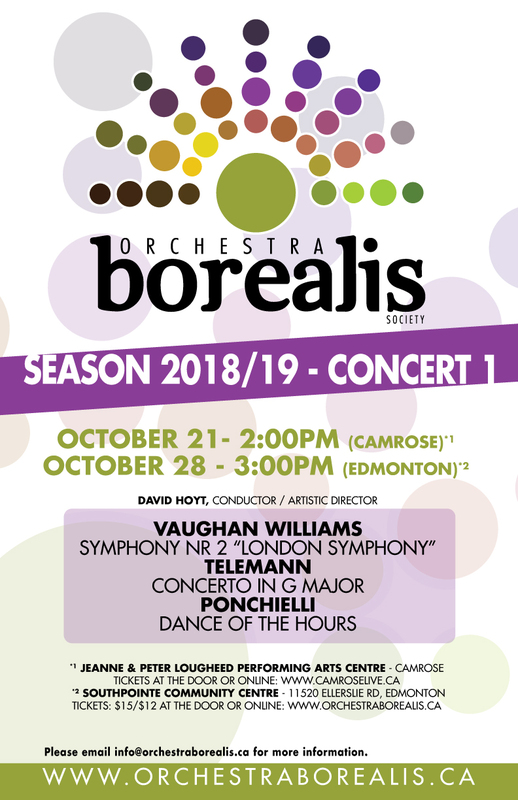 Sunday, October 21 the orchestra plays in Camrose to open the classical series at the Peter Lougheed Performing Arts Centre. The group returns to Edmonton to perform at South Pointe Community Centre in Edmonton on Sunday, October 28. The concerts open with the ever-familiar ‘Dance of the Hours’ by Ponchielli followed by Telemann’s lovely viola Concerto in G – a lush 14 minute baroque piece performed by the orchestra’s own Ian Carruthers. The orchestra’s symphonic offering is the London Symphony by English composer Ralph Vaughan Williams. Heavily revised by the composer, this romantic work has its foundation in English folk music and is meant to be evocative of various settings in London. 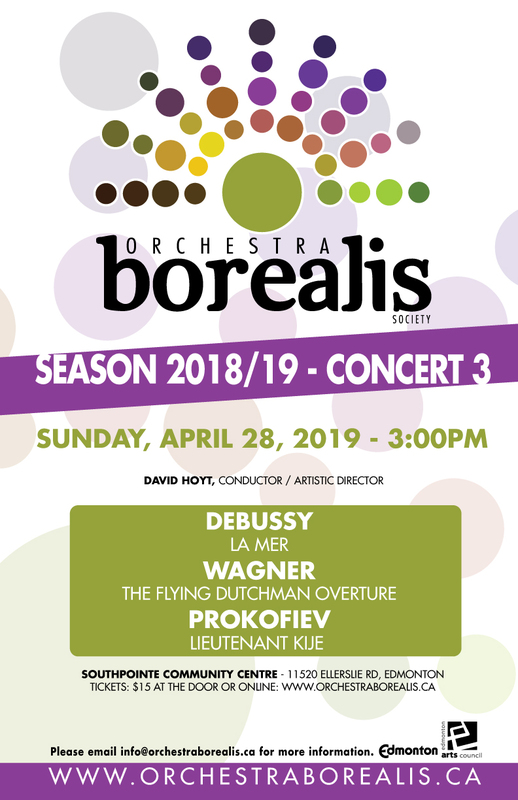 The London symphony is a complex and beautiful work engaging the full breadth of the orchestra and is sure to be an audience favourite. On Feb 10 Orchestra Borealis will be performing their second concert of the season. We have been taking a look at the repertoire that will be performed for our audience. Like the Symphony No. 4, the Fifth is a cyclical symphony, with a recurring main theme. This work was composed after a fairly productive compositional period and Tchaikovsky was worried that he had exhausted his creative abilities. Thanks to his perseverance this symphony has proven Pyotr Tchaikovsky to be one of the romantic eras finest composers.